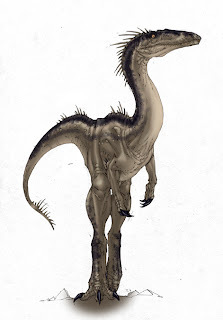 Protofeathers on a Coelophysis? that's a good question.... I'm not sure either, but it's possible- protofeathers may have evolved early in theropods, or that might have taken longer, maybe into the Jurassic. Because the fossil record is by it's very nature incomplete, and because not all of the animal is fossilized, we may never know.